A while ago, at the November supper club I hosted, I made a celeriac, Stilton and pear soup. Then Christmas descended and I forgot all about it until I came across some photos I had taken of this wonderful winter warming soup. 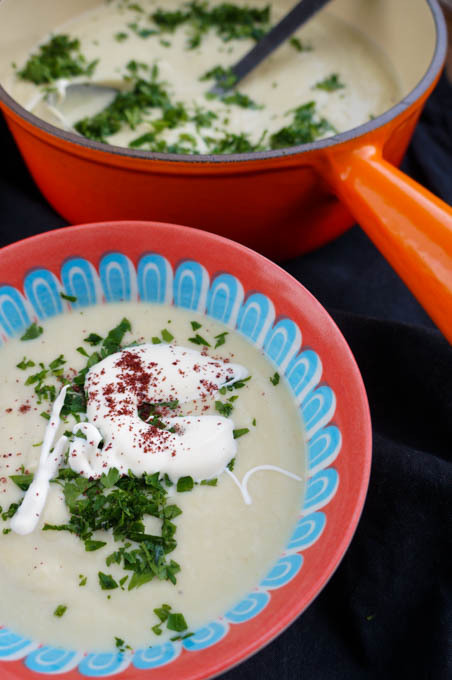 If you haven’t yet tried celeriac, soup is definitely a great place to start. Celeriac is the most obscure looking vegetable. Gnarly and dotted with brown pimple marks, it looks as if it is well past it’s best, but trim away the surface and the firm, creamy flesh is revealed. I enjoy celeriac as much raw as I do in soups but what you will find when making a celeriac soup is the flavour and texture melts into a creaminess that is incredibly smooth, especially when you blend it (as I did) in a Froothie. The Froothie gets so much use during winter and can blast a generous quantity of soup into the silkiest puree with no effort at all. The addition of pear and Stilton to this soup was inspired by enjoying these flavours together in a salad. The pear adds a sweet note, the Stilton a saltiness. Both emphasise the natural soft, nutty notes of the celeriac. 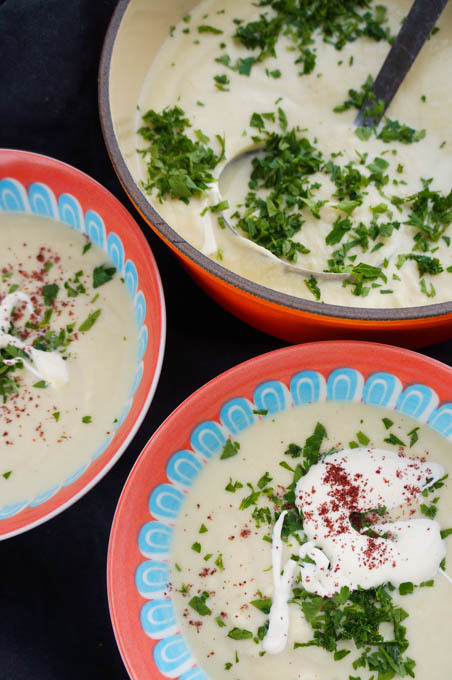 A little splash of cream finishes this soup off perfectly. Luckily the supper club guests agreed! I am linking up to No Croutons Required (Lisa’s kitchen & Tinned Tomatoes), Extra Veg (Fuss Free Flavours & Utterly Scrummy), SuperSoups (Jo’s Kitchen) and Cook Once Eat Twice (Searching for Spice). Stir through the crumbled Stilton and the cream. Check the seasoning. Serve in soup bowls garnished with creme friache and chopped parsley. This soup will keep in the fridge for 4 days. It can also be frozen. I always struggle with celeriac and never sure what to cook with it. This soup look so creamy, yum! Hi Jemma, I defintely think soup is the way forward! Will do Jo, thanks for the reminder! I love those bonus blog posts that come from a forgotten set of pics! Celeriac is really underrated so it’s lovely to see this recipe – looks luscious. Yes, I love that discovery too, always a bonus to already have the pics to go with a post! Love the humble but versatile celeriac and I use it in a myriad number of recipes but yet to have it in a soup, your soup looks so moreish and creamy ! Agree Manjiri, such a good vegetable but underused by all! This does look beautiful! I can see why the supper club guests enjoyed it. I’m a real fan of celeriac but I don’t think I’ve used it as the main ingredient in a soup before. I love it in coldslaw at the moment. Thank you so much for linking up with #CookOnceEatTwice. It does work so well in colseslaw too Corina, good idea! Hi Kirsty, thanks for your comment and so glad you like the soup! This soup looks delicious. 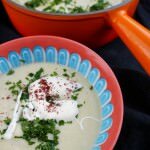 I put roasted apple and chestnuts in my celeriac soup – similar but different to yours! Oh what a good idea Hatti, will try that next time! Corrr, there’s some great flavours going on in that soup! I love celeriac but mostly eat it raw, in fact I don’t think I’ve ever used it in a soup. Must rectify this immediately! Hi Janey, I love it raw but also in soups it works really well. I love celeriac and your soup looks great. I’m going to have a bash at growing some celeriac this year too! Laura this soup looks amazing – LOVE the combo of ingredients. It’s a good one Jan! I need to be more adventurous with soup, I so rarely make it and when I do it’s often old favourites. This one looks like a real keeper and I do keep saying I want to cook celeriac more often. I love your bowls by the way! Thanks Kavey, I try and make a soup each week so I can have it for lunch so I do try out quite a few! Yes Camilla, blue cheese is lovely in soup!